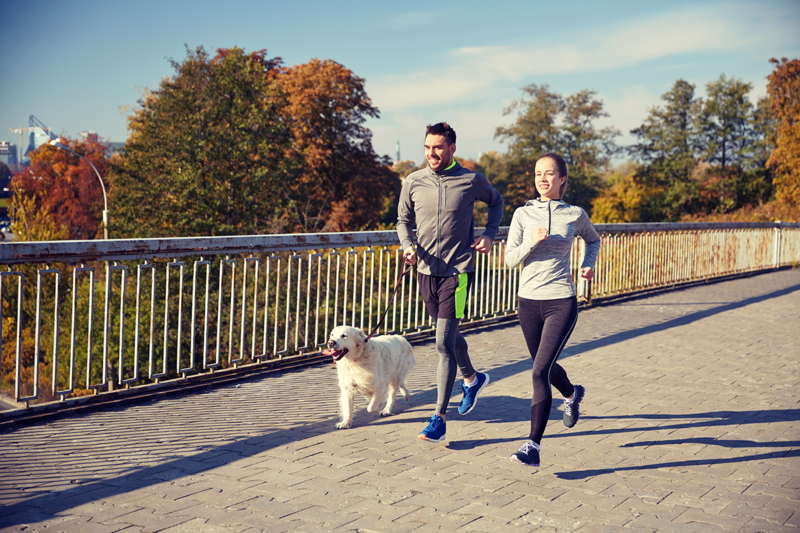 Many dogs require vigorous exercise, and a daily run is a good option. However, just like humans, dogs must be acclimated slowly to running. Below is a short guide to everything an owner should know before taking a dog for a run. Which Dog Breeds Make the Best Runners? With the extensive variety of dog shapes and sizes, it should come as no surprise that certain dogs make better running partners than others. Dogs from the sporting and herding groups tend to be exceptional runners, while running can be dangerous for breeds such as English Bulldogs and Basset Hounds. Among the best dog breeds for runners are Weimaraners, German Shorthaired Pointers, Huskies, Vizslas, and Labrador Retrievers. Before you take your dog for a run, there numerous training commands that can make your run go more smoothly. For dogs with a strong prey drive, the “leave it” command is useful. If you plan to run with your dog off-leash, you must have a solid recall command in place. For urban or suburban runs, “wait” is handy for when you must stop and wait at stoplights or before crossing the street in busy traffic. Finally, directional commands are also useful. You can begin to teach your dog commands such as “go right,” “go left,” “cross the street” and “straight” during walks. Simply use the appropriate command every time you change directions and give your dog praise for following orders. Running requires little equipment to get started. However, when running with your dog you should always use a properly fitted harness. Never attach a leash to a collar around your dog’s neck, as running can place additional strain on the trachea and esophagus. The harness that you choose should not be the type that tightens as the dog pulls, as this style could discourage your pet from running. The type of leash that you choose also matters. There are numerous leash styles intended to make running with your dog easier. Bungee-style leashes reduce tension placed on both the runner and the dog. Some runners prefer having both hands free and opt for a leash that wraps around their waist. This style also reduces the risk of dropping the leash should the runner trip and fall. Finally, a portable water bowl is ideal for longer runs. Dogs should take small, but frequent, sips of water on warm days. Before getting started with a running routine for your dog, take a visit to the veterinarian. 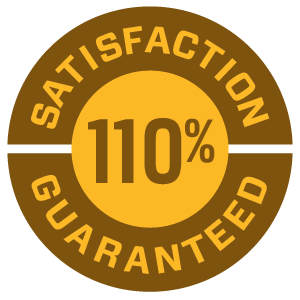 The vet will be able to tell you whether your dog is a good candidate for consistent running. Reasons your veterinarian may tell you to proceed with caution include obesity, joint problems, age, or heart conditions. A dog should never start running until his or her bones and joints are fully developed. Once your dog has been cleared to run, the next step is to start slowly. On the first day of running, go for 8 – 10 minutes. Gradually increase the amount of time your dog spends running by 2 – 5 minutes every other day. Recovery is necessary for any dog that exercises. If your dog is at a healthy weight before beginning a new exercise routine, consider whether extra food is appropriate to maintain body mass. Your dog will be thirsty after a run. However, do not allow him or her to gulp too much water after exercise. Limit your dog’s food and water intake for 30 minutes before and after running to reduce the risk of bloat. 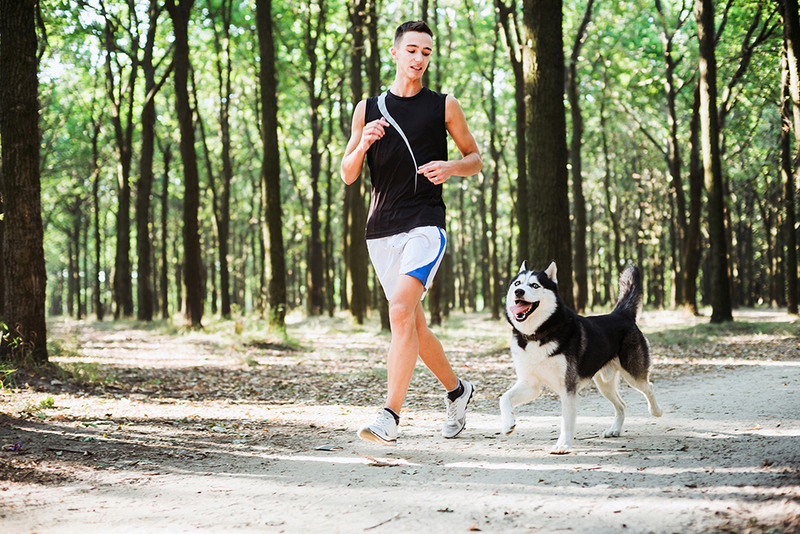 Just like in humans, vigorous exercise can increase the amount of inflammation in a dog’s gut. This inflammation, when left unchecked, is a contributing factor to chronic disease. 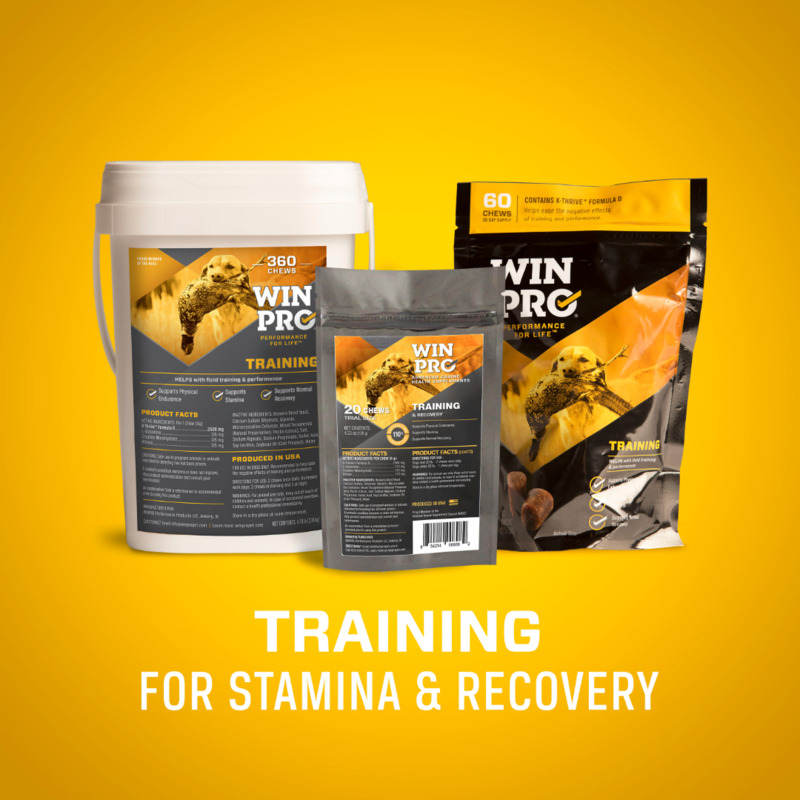 Providing your dog with a supplement such as WINPRO Training fights inflammation thanks to the proprietary K-THRIVE D blood protein blend. Additional active ingredients of L-Glutamine, Creatine Monohydrate, and Ribose support muscle growth and athletic performance while decreasing fatigue. Overall, dogs make excellent running partners. Care should always be taken to ensure they are properly acclimated to running, that the right equipment is used, and they are given plenty of time for recovery in order to maintain their health.